I do not know if I would hang a print of this painting in my home, but I must say there is something about the very determined look, on these men’s faces, that draws me to them. 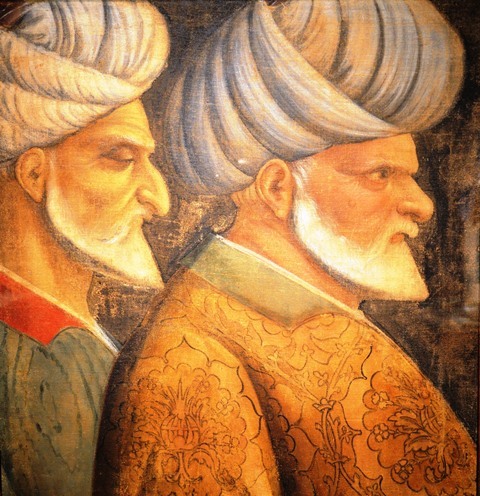 Also, I quite like the contrast between the flowing lines of their turbans, the sharpness of the angles that make up their faces, and the intricate print of their clothing. They look so stern and solid, yet I find them to appear rather dependable, completely without reason. This painting hangs at the Chicago Art Institute, in Chicago, Illinois. In case you are wondering, as I was. “Born to a Sephardic Jewish family which fled Spain and possibly relocated to the then Ottoman ruled Smyrna, Sinan sailed as a Barbary corsair, a type of privateer or pirate, under the Ottoman flag. There are several cases of Jews who upon fleeing Iberia turned to attacking the Empire’s shipping, a profitable strategy of revenge for the Inquisition’s religious persecution. He was based out of Mediterranean points including Santorini, and fought in several key battles against the Spanish and the Holy Roman Empire, at the time ruled by the same man, Charles. This entry was posted on March 20, 2019 at 12:01 am and is filed under Art, SlideShow. You can follow any responses to this entry through the RSS 2.0 feed.